In April of this year, Perfect World Entertainment published their newest in their line of first person shooters, a sequel to Blacklight: Tango Down; Blacklight Retribution. At [blank]’s Universe, we cannot comprehend how a multiplayer exclusive game can be considered a sequel in any way considering there is absolutely no story present in the gameplay at all. However, even without any campaign components, we found it to be both entertaining and immersive, at least for the first half of the week. For those of you who don’t quite remember which game this was, it was the one with a lot of dubstep. After all, anything and everything can be made better with dubstep. Gameplay wise, Blacklight: Retribution introduced some rare abilities that most games do not legitimately offer in multiplayer, such as “wallhacks” (seeing through walls) through the futuristic Hyper Reality Visor or even earning mech suits with killstreak points, as opposed to air support. In terms of weapon variety, this game focuses intensely on weapon customization, almost as much as Tom Clancy’s Future Soldier. You start off by purchasing the receiver (base weapon, eg. Assualt Rifle, SMG, etc. ), and then customizing the individual components, such as the barrel or stock to your liking. By purchasing lighter components, your character can move around with greater ease, at the consequence of having more spread and recoil. On the other hand, using heavier equipment reduces spread and recoil, consequently slowing you down. Customization however is not only limited to your guns, but also your character, similar to Halo 4’s where you can customize your suit, helmet and ensigna. There are more than 20 different helmets available for your selection, unlockable through achievement, while ranging from buckets to simple armor. Graphically, Blacklight: Retribution was very appealing, and although it was powered through Unreal Engine 3, it looked amazing for a free to play online game, taking advantage of features such as dynamic lighting. The sound quality was just as good, with upbeat dubstep on everything. 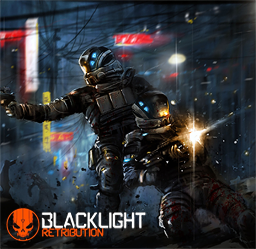 Ultimately, Blacklight: Retribution, developed by Zombie Inc proved to be a largely satisfying to play, and will be remembered as one of the best futuristic free-to-play first person shooters out there.